"50 years, it makes you proud, and the band is very well worth it. The band plays incredibly, and even to this day, it’s a very high quality on stage." - Alan White. Rock And Roll Hall Of Fame inductees Yes have been traversing the Topographic Oceans for almost half a century. It’s a fact not lost on the progressive rock pioneers as they prepare to set sail on their 50th anniversary tour. We sat down with drummer Alan White to discuss the milestone, the band’s Hall Of Fame performance, and his early work with John Lennon and George Harrison. Going for the one; Eamon O’Neill. Hi Alan, how does it feel to be celebrating Yes’ 50th anniversary? It makes me feel old, number one! You know, it’s a long time to be in a band. I’ve been in the band forty-five years this year, so that’s a hell of a long period of time with the same band. If you’d have told me that forty-five years ago, I’d have probably just laughed at you. But anyhow, here I am. When you joined Yes back in 1973, did you look at a the job as a longer term prospect? Oh, not really. I mean, it’s all part and parcel, and it just goes on. Really, when I joined the band, I just started living the life of Yes for so many years. I didn’t really give it much thought; I just got on with it, became part of what the Yes culture is, and grew up with it, and I’ve been there ever since. Do you still enjoy it as much all these years later? I like the music very much. It’s not easy music; it’s very challenging to play, but it’s good we have a good band doing it, which we are. You must be the longest serving member of Yes, after the late Chris Squire. Yeah, I’m actually the longest serving continual member. Did Chris’ passing hit you hard, having worked with him so closely over the years? Yes, for forty-three years we were a rhythm section. Chris is sorely missed, but now we have Billy Sherwood playing bass, and Billy, Chris was his mentor when he was growing up. He’s did a great job of playing on all the music, and he pretty much knows everything that Chris ever did, inside out. So he basically gets on with what is needed, where it’s needed, and when. The fans seem to like it, and it’s worked out. What can fans expect from the band when you hit the stage for the 50th anniversary shows? I don’t think for the 50th anniversary we’re doing a lot of long-winded pieces. I think we’ll be doing renditions of some very classic Yes songs, and a mixture from over the years. Myself, I’ve always been one of the guys in the band who like to do more obscure kind of material that we haven’t heard for a while. We’ll figure it out, but we all have our favourites that we like. I think we should do a rendition from a lot of different material from over the last fifty years. Is it a tough task choosing what material to play? Yeah, because the band has so many eras, you know? There’s a hell of a lot for us to pick from, because we’ve got twenty-nine albums with the complications, and we’ve got twenty-one studio albums. We all have our favourites that we love to play. I personally love playing ‘Awaken’ from ‘Going For The One’  and a lot of that kind of stuff. I love playing ‘America’ [Paul Simon cover from 1975’s ‘Yesterdays’ compilation]; that’s such a great song to play on stage. The ‘90125’ era is one that was a very different Yes. Well, the classic line-up, for me, was Rick [Wakeman], Jon [Anderson], myself, Chris Squire and Steve Howe. It was the line-up that went through the seventies, that is basically known as the ‘classic’ line-up. But right now, the band currently - this version of it, is playing excellently. We’ve got some really, really good musicians playing there. Yes were finally inducted into the Rock And Roll Hall Of Fame earlier this year. Everybody says ‘at last’, that’s for sure! It’s great to get recognised by your peers and people in in the business that have been listening to your music for so many years, and put us in a place we really should be. 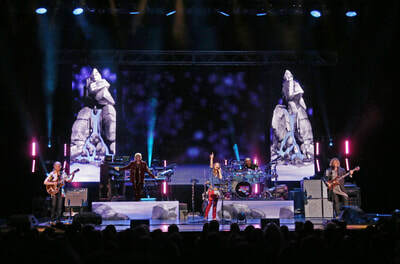 Did you enjoy performing on the night, with Jon Anderson and Rick Wakeman? Yeah, most definitely. It was kind of easy. We played ‘Owner Of A Lonely Heart’ which covers the eighties, and ‘Roundabout’ which is the seventies, so we covered a broad spectrum of Yes’ music. But any true Yes fan knows there’ve been a lot more eras that this band has been through. Back to the present day, and 2018 is going to be a busy one for the band, isn’t it? Yeah, we’ve got a cruise to do at the end of February - the ‘Cruise To The Edge’ - and then we have a month off, and then we get ready for the summer tour, and we’re touring Europe, and then we tour America for about thirty-five shows. So despite the milestone, Yes show no signs of slowing down? A couple of us have little ailments and stuff like that, but we’re still ploughing on there! It’s been three years since the last Yes album ‘Heaven And Earth’; when are fans likely to see album number twenty-two? Oh boy, that was a while ago. That was just something that we had that developed. It was playing on everybody’s mind, so we just went in and put it all down to clear the spaces for more music, which probably won’t happen until 2019, I would say. Having a whole year of touring, you’ve got to take up a whole lot of time; we have to go to South America, Japan. It takes time to go around the world and please your fans. Looking back at your pre-Yes history, and you played on albums by two of The Beatles. Yes, I did play with two Beatles. I played with John [Lennon], and I played with George [Harrison]. They were landmark albums. Did you know when you were recording ‘Imagine’, that it was going to be so monumental? Yeah. It was kind of really weird that album, because I went to do a live session, and John seemed to really like me, and kind of almost took me under his wing, as it were. We became friendly, and then he pretty much liked having me around, and so I ended up playing on quite a lot of his stuff. How did working with George Harrison come about? He came down to the ‘Imagine’ sessions, and he really liked the fact of me being around. He was a beautiful guy, a really, really great guy, and so was John. I really enjoyed hanging with them, and I got accepted into the Beatles’ family, kind of thing. It was a wonderful time in my life, and a kick off start to my career, basically. You must be extremely proud of that musical journey that began back then. Yeah, you know, it’s also a legacy you’ll never forget about. I mean, with such a classic song as ‘Imagine’; it was the song of the millennium, so you can’t say much more than that. Finally, and going back to Yes and the 50th anniversary; what has been your personal highlights from the band’s career? Oh my god, with a career that’s forty-five years? Well, playing in front of 350,000 people in Rock In Rio in the eighties was quite a thing to do. A lot of things like that; we have the record for sold-out shows at Madison Square Garden [in New York City]; we played seven shows sold-out, and were one of the first bands to do that. It makes you proud, and the band is very well worth it. The band plays incredibly, and even to this day, it’s a very high quality band on stage; it gets everything right, and we don’t just put any crap out there, as it were. We get on with it, and we get it done properly. Yes' 50th Anniversary UK Tour kicks off in Bristol on 13th March 2018. For a full list of dates, see below. 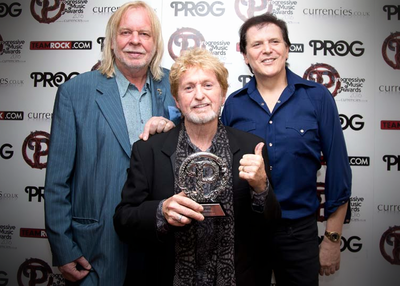 EXCLUSIVE: Jon Anderson Talks Yes, '90125' & The RnR Hall Of Fame. 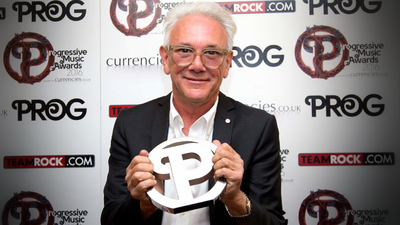 INTERVIEW: Trevor Horn On Yes' '90125' & More.